Are you ready for a TON of photos?? While this may have been my slowest marathon to date (thanks to my knee! ), I may have PR’d in character photos! This was my 5th year in a row running the Walt Disney World Marathon and while I was nervous about how my knee would hold up going in to it, I am so thankful I finally got to share this amazing experience with Jason – enjoy the recap! 2:30am – Rise & shine, it’s marathon time! 3:30am – Bus to start! I had finished the half marathon the day before, but I wasn’t sure if that meant I should be optimistic that I could finish the full, or worried that I already got 13.1 miles out of my knee and that another 26.2 might just be asking for too much. Going into the race Jason and I had gone back and forth a lot on whether he and Pat should just go run the race or if he’d stay with me for better or worse. Better being I actually manage to run/ walk the entire 26.2 miles (albeit sloooowly), worse being my knee gives up early and we’ve got a looooong walk ahead of us. In the end he decided that the point of us doing this race was for us to experience it together. We hadn’t trained to run for time (hello, character stops! ), and we had been talking for months during training about how excited we were to finally run this race together. So, it was settled, our only goal was to get to the finish line together. I used all the same support as I had the day before – RockTape, compression pants, Tylenol and IT band strap and I had a bailout backup plan in mind. Should my knee get bad to the point that it even hurt walking and I was not going to finish, I wanted to drop out at either the Magic Kingdom or Animal Kingdom where I could get quick transportation back to Epcot, vs. dropping out farther along the race at a medical tent and having to wait for the busses at the end of the race. So, back to the starting line…never have I been so nervous about whether I was actually going to be able to finish a race or not, but it (really!) helped that I knew no matter what happened I’d have company. We decided to use 4 minute run/ 1 minute walk intervals and to walk through the aid stations so I’d be giving me knee enough rest. My knee started to hurt pretty quickly which had me nervous about getting past my Magic Kingdom or Animal Kingdom drop out points. Our first character stop was with Chicken Little…not that I’ve ever seen this movie, but heck, I didn’t know how long I’d last in this race and I want to make sure I got at least some character pictures! Same as during the half I walked down the steep decline near the Contemporary heading towards the Magic Kingdom since the declines bothered my knee and we kept run/ walking our way towards Main Street U.S.A. I remember heading into the Magic Kingdom and groaning on a few steps as the pain in my knee got worse and I just kept telling myself to get through the Magic Kingdom. …and found Lilo and Stitch in Tomorrowland. At each character stop I’d stretch my IT band and bend my knees hoping I’d work something out and would be able to keep going – luckily there were a lot of stops in the Magic Kingdom! We saw Cogsworth just as he was swapping places with Lumiere, the Country Bears and Brer Bear and Brer Fox back by Splash Mountain! My knee was not particularly happy at this point, but I figured if I kept going a little farther the Grand Floridian and Polynesian were also acceptable drop out locations with transportation available, so I grimaced a few times until we made our way to Mary Poppins! I remember saying to Jason, I’m not sure how much more I’m going to be able to keep up with the run/ walk…again I figured worst case I’d walk to Animal Kingdom which was about the halfway point and I knew my friend Jenn was spectating there if I wanted to just drop out and hang with her. Then the pain sort of went away. Not totally away, but went from the sharp “on the verge of a limp” pain back to the dull “can’t forget it’s there” pain. On our way to Animal Kingdom we found the wicked witch from Snow White and Jafar from Aladdin…. …and entering Animal Kingdom we came across some of our cutest spectators! If I remember correctly the pig’s name was Emmy Lou, the turtle down there, his name is Flash (as you can see on his race bib!) and the donkey had a custom marathon spectating coat on that said “keep hoofing it!”. We also saw Baloo and King Louie inside Animal Kingdom! As we exited Animal Kingdom I knew it was my last chance to bail if I didn’t want to have to wait until the very end of the race for transportation back. My knee pain was still coming and going in terms of severity, but I wanted to keep going. I was halfway through and if I had to walk the second half I felt confident I could at least do that. …and they wouldn’t let us lie down for a picture like we had in past years! I was not particularly happy about that…the gravedigger picture lying down mid-marathon is always one of my favorites, but as we ran over the photographer yelled, “stay standing, no lying down!” Boo. We got to ESPN Wide World of Sports and I warned Jason about the 3 miles of twists and turns we were about to encounter! Along the way we found Mickey (YAY! ), Donald and Chip & Dale all in their sports attire! Unfortunately this is where my knee started to go downhill a bit. I hate to admit it because I know before I left for the trip I promised no limping or tears, but there were definitely times at this point I had a pretty good limp going on. I kept hoping the walk breaks would revive my knee as they had done earlier in the race, but at this point I couldn’t even push off my “bad” leg to start running…I actually had to hold on to Jason to almost push off him to get moving again a few times, but every time he’d ask if I was ok, I’d just shake my head and tell him I was fine. The pain was worse, but it still wasn’t the tear inducing, shooting down my leg pain I had experienced a week earlier. Every mile we passed felt like a HUGE accomplishment – I mean just days earlier I had contemplated not even starting this race, so to be at mile 20 and still be moving felt like such a treat. …and then before we knew it we were in Hollywood Studios! We met The Incredibles, and some of the Monster’s Inc. crew! As we came out of Hollywood Studios we started to pick up the pace…and I started to skip the walk breaks. My knee went from limping and (me) groaning as I tried to run to honestly being completely pain free. Seriously, the last 3 miles of the race my knee didn’t hurt AT ALL. So we RAN! …then RAN past the Yacht and Beach Club towards Epcot. And it was. It was amazing. I’ve always loved this part of the marathon, but this was honestly the first time I almost cried, I hadn’t even let myself imagine running this victory lap around World Showcase. Just a few days earlier I was stressing about whether or not I should even show up at the starting line of this race. I was sure if I did start the race, that the only way I was getting to the finish line was walking and yet here I was at mile 25 running (and in not too bad of a time either!). …and found Cyanne outside of Norway! I was so happy to see her. She had stuck with me during the half marathon the day before and she knew just how stressed I was heading into the full marathon – and here I was giving her a big, sweaty hug almost at mile 26! I will say my one disappointment was not being able to get a drink in World Showcase! My silver lining to running a slower marathon was that I would be able to get a grapefruit beer in Germany or a margarita in Mexico for my celebratory lap and to cross the finish line with! I can’t complain though, we crossed the finish line in 5:20:19, an amazing time considering we run/ walked the entire race, stopped for 20+ pictures and 5 push-ups! I also can not thank these two guys enough for sticking with me! They dealt with my walk breaks. My slower pace. My occasional limping. They stopped for tons of character photos so I could rest my knee and stretch. Just having them there for company to keep me from thinking about my knee kept me going. Just as I was thankful to have Cyanne by my side during the half marathon, I am so thankful to have had Pat by my side for not only this marathon, but during many other races and training runs and Jason by my side always! And with that, the 2016 Goofy Challenge was complete! Have you ever had friends help you through a race? 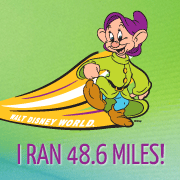 runDisney fans – what character would you love to see during a race?? You guys saw some amazing characters!! !I didn’t even know Cogsworth was a character that came out! So fun! Glad you were able to finish and hopefully you’ll get some relief from that miserable knee pain. Congrats on another Goofy Challenge! What the HEY is going on with that knee of yours???? So glad it worked out for you though! Great job! You’ve earned some rest and work on that knee! congrats on finishing Goofy!! and im OBSESSED with the characters you had out-I hope they are out at future races! Congratulations on being able to finish! Now GO GET THAT KNEE CHECKED OUT! Soooo glad you were able to complete Goofy, and it looks like you guys had an absolute BLAST. Love it when I see other runners stopping for just as many photo opps as I do, LOL. Also, I can’t NOT cry during that final victory lap in Epcot…could the music be ANY more appropriate for that final mile of a marathon?! Congrats again to you and Jason! !